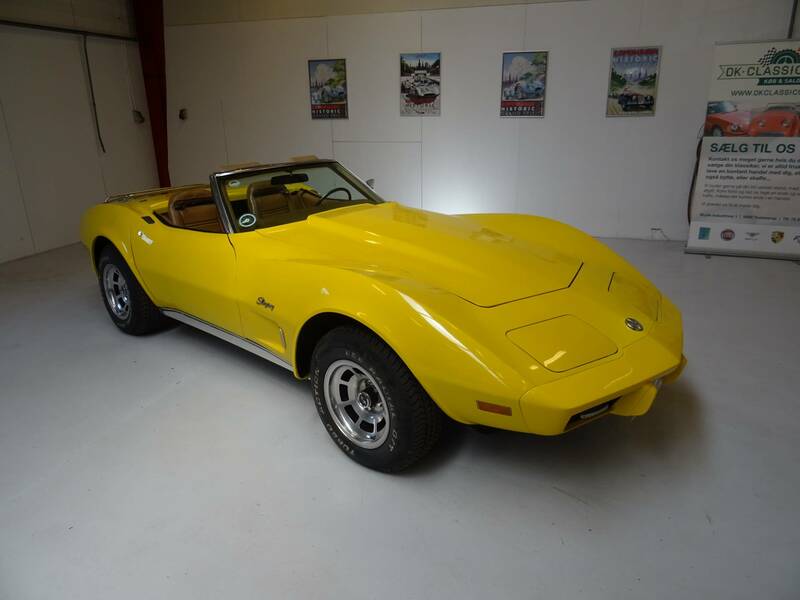 1975 Corvette Stingray Convertible with automatic transmission. The car present very well and have no cosmetic or mechanical issues. The car has the rare factory correct Bright Yellow color code 56L exterior paint. Only 2,869 produced in this rare color. This is the last year of the corvette C3 convertible making this a historical and desirable car. The car has Danish papers and registration. The Chevrolet Corvette (C3) was a sports car that was produced by Chevrolet for the 1968 through 1982 model years. Engines and chassis components were mostly carried over from the previous generation, but the body and interior were new. It set new sales records with 53,807 produced for the 1979 model year. The C3 is the third generation of the Chevrolet Corvette, while the 1969 through 1976 models mark the second generation of the Corvette Stingray. 1972 was the last year for chrome bumpers at both front and rear, the vacuum actuated pop-up windshield wiper door, as well as the removable rear window common to all 1968-72 coupes. The key activated anti-theft alarm system became standard. The increasingly popular choice of an automatic transmission was installed in most corvettes for the first time, with nearly 54 percent so equipped. Only one engine size was offered for the 1975 Corvette.